A joint team consisting of Biduk-biduk Police, PROFAUNA Borneo, BPSPL Pontianak, Ministry of Marine Affairs & Fisheries, Berau Marine Affairs & Fisheries Service, and a local NGO called BLB went on a patrol to forestall fish-bombing and sea turtle eggs poaching in the waters of Berau on Tuesday, 25 October 2016. 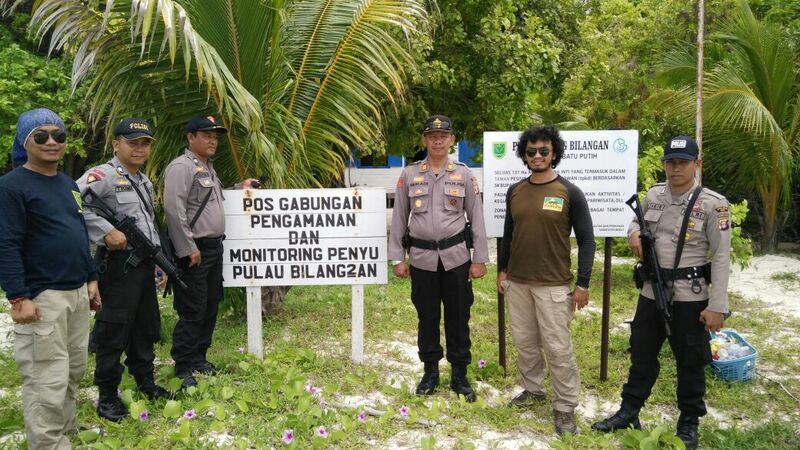 The armed patrol team was led by the Chief of Biduk-biduk Police Department, AKP Suradi SH, and departed from Lenggo, Batu Putih, for Bilang-bilangan and Mataha islands where Green Sea Turtle and Hawksbill Sea Turtle nest. Sadly, the waters around these two islands are also prone to fish-bombing. The team conducted a thorough sweep along the lines from Lenggo, Manimbora island, Balikukup island, Karang Kandalahang, Mataha island, up to Bilang-bilangan island. They also inspected all ships harbored at Mataha and Bilang-bilangan islands to make sure that they do not carry illegal fishing equipment. In Bilang-bilangan island, the Chief himself examined 62 artificial sea turtle nests containing 4.380 eggs confiscated by the Police of Tanjung Redeb on 26 August 2016 from a smuggler. These eggs had been replanted in this island immediately after the seizure. The team was fortunate that day, to had an opportunity watching 15 sea turtle hatchlings surfaced from their nests. "We are glad that the eggs we replanted could develop well and hatch in time," said Bayu Sandi, the coordinator of PROFAUNA Borneo. PROFAUNA highly appreciates the police's endeavor, particularly the sea patrol which hopefully could become a regular program. "This is a positive action, and we wish this could be a regular program to strengthen our fight against fish-bombing and sea turtle eggs poaching in Berau," added Bayu Sandi.